The village of Rhosllanerchrugog originally represented a mining community in the North East Wales coalfield. And as in many other similar communities, choral singing was an important social involvement around the end of the 19th century. But the local singers were particularly good, and the achievements of the Rhos choirs were such that few could match them at the many competitive events which were popular at the time. The village's unique reputation for its musical culture was based on the excellence of its choral music, and this continues even to the present day with the existence of two large male choirs, two mixed choirs, a musical theatre society and a female choir. 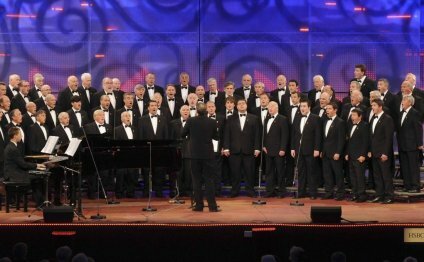 The Rhos Male Voice Choir has always been considered the premier choir in the community and has won international acclaim. The emphasis now is on concert work and the choir has toured extensively and maintains a busy schedule with engagements currently being booked two years in advance.